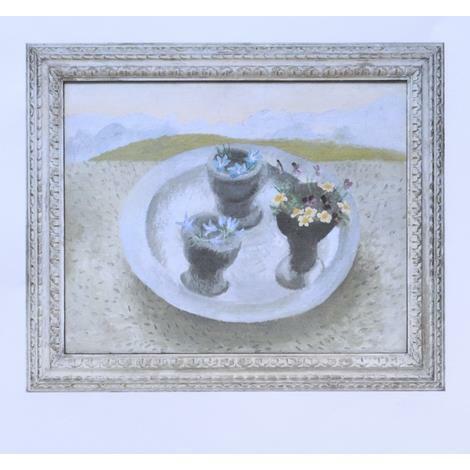 On seeing this painting, in an auction house in Cornwall, we were immediately reminded of the work of Kate Nicholson's mother, Winifred. We also responded with pleasure to the fluid paint, the gloriously acid colours and the abstract authority of the composiiton. 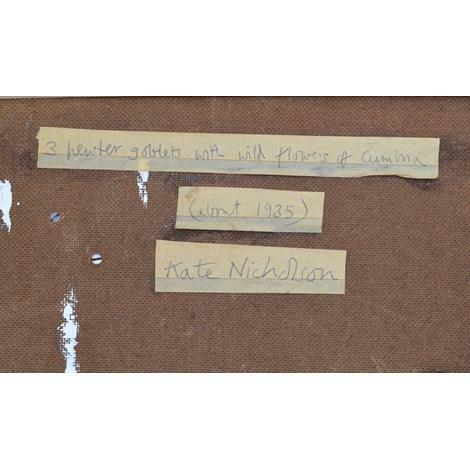 Curiously, attached to the back of the picture - apparently in Kate Nicholson's hand-writing - is not only the title, but the date, c.1935. This, of course, is puzzling. Kate would have been five or six. Ever since, we have been trying to excavate more information about this painting, to help answer the obvious questions, and have gradually discovered a fascinating tale. First of all, we can confirm that the picture was, indeed, painted in Cumbria, probably in Boothby, Brampton. In fact, it must have been painted when Kate Nicholson was sitting just to the right of her mother, and they were working on the same composition, side by side, elbow to elbow. One reads, often, about Kate and Winifred writing to each other, exchanging ideas about art, travelling and painting together - and, in 1959, Winifred and her daughter spent the first of what would become many painting trips to Greece, which they came to love. But we have not, hitherto, found any example of the two plainly studying the same subject: indeed - the acid green which envelops the pewter dish in Kate's picture might well have started life on the same palette as her mother's, slighly more ochre-green of the middle ground in her painting, Live Pewter (see image, for reference). 'pewter dish and cups pictured were heirlooms purchased by Nicholson at an auction held by her uncle, the 11th Earl of Carlisle, at her family's Naworth Castle estate in the 1940s. These items of ancestral importance, placed within the Cumberland landscape of the artist's birth, create a poignant symbol of the artist's identity'. Likewise, of course, for Kate Nicholson, her painting marks not simply her own interest in her family's heritage, but, more specifically, her intimate personal and artistic relationship with her mother. The date of the painting must be in the 1950s - Winifred's painting is variously dated as '1950s' and even '1959'. We suspect that the mid-1950s might be right; and it might suggest that the '1935', noted on the back of Kate's picture, was intended as, 'c.1955'. Kate Nicholson's flowers - primroses and heartsease and Chinodoxa (Glory of the Snow) - are the same as her mother's; that is, except for Kate's addition of a couple of Fuchsia. Curious: the rest are early Spring flowers and draw our attention to the exhilarating blast of Spring in Kate's trumpeting limes, greens, yellows and silver. Did Kate find the Fuchsia in her mind's eye, in a conservatory, in a sunny window? Wherever she found it, the touch of crimson lake serves the purpose of providing a crisp, complementary colour to the enveloping green and resonates against the pale silver-white of the pewter plate. Lyrical, free, liquid - Kate's picture is more abstract, more dream-like than her mother's. But it is, similarly, a complete delight. 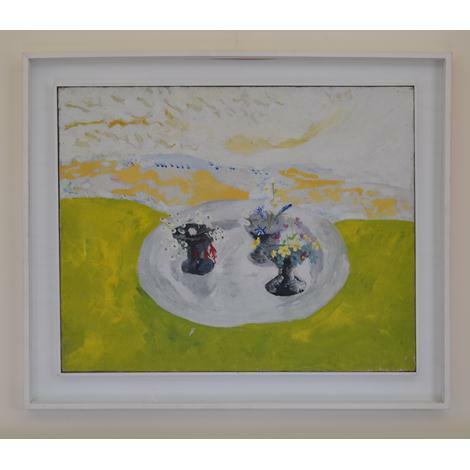 The painting came from the collection of Joan and H.C. (Gillie) Gilbert, who ran the Wills Lane Gallery in St. Ives for decades. Gillie himself was described as, 'artistic treasure', a man who, 'for some 50 years did so much for art and artists in St. Ives'.